1. Place the water, salt, and sugar in the TM. Process at speed 5 for about 3 seconds to dissolve the salt and sugar. If it’s not dissolved, process some more. 2. Add the remaining liquids (egg, vanilla, and oil). Optionally, you can add a few drops of yellow food color. 3. Process at speed 5 for about 3 seconds to mix everything together. 4. Add the flour, yeast, and baking powder. Process on speed 5 for about 4 seconds to get the dough started. Then process on knead for about 4 minutes. 5. Turn the dough out onto a floured work table. TIP: Scrape out the dough you can, and then process again at speed 7 for a second or two. This will spin the dough off the blades. Scrape out the remaining dough. 6. Flour your hands and the top of the dough. Pat it out flat. 7. Fold about 1/3 of the dough over onto itself. 9. Pat the dough out again. 10. Fold the top 1/3 down over the middle 1/3. 11. Fold the bottom 1/3 up and over the other 2/3’s. 12. Rotate the dough 90 degrees, pat out again, and fold bottom 1/3 up over the middle 1/3, and push edge down into the dough to seal. 13. Fold top 1/3 down and over middle 2/3’s and crimp edges to seal. 14. Cover dough and allow to rise for 45 minutes. Return it to your work surface and pat out again. Distribute 2/3’s of the raisins on the top 2/3’s of the dough, gently pressing the raisins into the dough (you don’t want them to pop out the other side. 15. Fold the bottom 1/3 up over the middle 1/3. 16. Fold the top 1/3 down over the middle 2/3’s. 17. Rotate the dough 90 degrees, pat out, and sprinkle remaining raisins, pressing into the dough. 18. Fold the bottom 1/3 up over the middle 1/3. 19. Fold the top 1/3 down over the other 2/3’s. Pat out a bit. 20. Fold the dough in the middle and seal the edges as before. Allow to rest 10 minutes. 21. now you have to prepare the final shape. You can cut into equal pieces and braid them, roll out into a long rope and then curl into a spiral, or roll out to just the size to fit into a bread tin. I used the tin tonight. 22. Allow to rise another 45 minutes while you preheat the oven to 350 degrees. Brush the top with an egg wash, sprinkle with poppy seeds, and bake for about 45 minutes. Fabulous recipe. It produces a challah better than any that you can buy. As a variation, I’ve added 30g each of chia seeds, sesame seeds, linseeds, and quinoa and also achieved a fabulous result. IT IS THE MOST AMAZING RECIPE!! 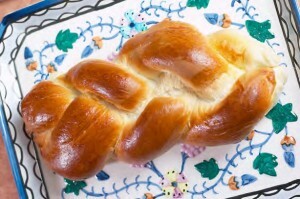 DO YOU HAVE A PINEAPPLE CHALLAH??? Sounds interesting though… Off to google! It is gr8 with 7 grams of bread improver… It makes it form a better dough!